My pages in this series. 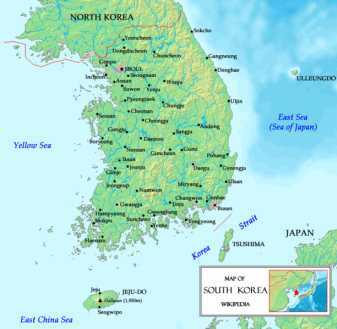 South Korea, officially known as the Republic of Korea is an East Asian country occupying the southern half of the Korean Peninsula. To the north, it is bordered by North Korea (Democratic People's Republic of Korea), with which it was united until 1945. To the west, across the Yellow Sea, lies China and to the southeast, across the Korea Strait, lies Japan. The Korean people trace their nation's founding back to 2333 BC by the legendary Dangun Wanggeom. Archaeological research shows that the first Korean settlers have occupied the peninsula since the Lower Paleolithic period with territories expanding as far as mainland China and eastern Russia during the Gojoseon period, the first nation established by Koreans. 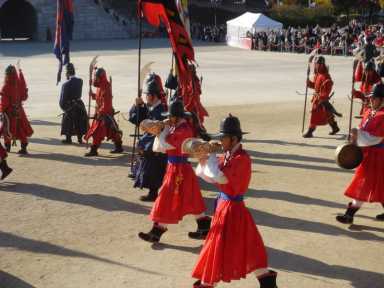 Korea's history has been turbulent at times with the last emperor of Korea dating back to the age of the Korean Empire. Since the establishment of the modern republic in 1948, South Korea has struggled with the aftermath of the Japanese control (1910-1945), the Korean War (1950-1953), and decades of authoritarian governments, undergoing five major constitutional changes. While the government officially embraced Western-style democracy from its founding, it was not until the December of 1987 that direct and fair elections were held and true democracy began to solidify. South Korea had one of the fastest growing economies in the world since the 1960s and is now one of the four largest economy in Asia and the 12-14th largest economy in the world. Inferring from the somewhat larger-sized underground economy in South Korea than other OECD countries, the actual size of South Korean Economy is possibly bigger than its known economic size shown in several indexes. In the late 20th century, many people referred to South Korea as a newly industrialized country and an Asian tiger due to its exponential economic growth. Today, South Korea is among the world's fastest growing developed countries and South Korea will be the world's 3rd richest country by 2025 with a GNP per capita of $52,000 according to Goldman Sachs, one of the world's largest investment banks. South Korea forms the G20 industrial nations and is a Next Eleven nation with many developing countries referring to its economic success as the "Miracle on the Han River," using South Korea's success story as a role model. However, the South Korea economy was awarded severely wounding for an 1997 Asian Financial Crisis. As a result, IMF managed the national economy. In the last decade, South Korea have steadied themselves but it has said that never regained the dazzling growth of the mid-1990s. However, despite of the certain views, South Korea has nearly miraculously recovered from the IMF crisis within a record-high short period, and has been showing a solid economic growth rate since the IMF crisis. South Korea has a "High" HDI of 0.921 and is part of both the CIA and IMF lists of advanced economies, being defined as a High Income Nation by the World Bank. International recognition of the country and its goods & services was enhanced by the hosting of the 1988 Summer Olympics in Seoul and further boosted by the co-hosting of the 2002 FIFA World Cup. South Korea is one of the world's most technologically and scientifically advanced countries such as nationwide 100Mbit/s broadband internet access, full HDTV broadcasting, DMB, WiBro and 3G HSDPA. It is currently the most wired nation in the world, with more than 90% of all homes connected to high speed broadband internet. South Korea is a global leader in electronics, computers, digital displays, semiconductor devices, mobile phones and high tech gadgets, headed by the two chaebols, Samsung and LG. South Korea also boasts the world's 3rd largest steel producer, POSCO and is the world's 5th largest automobile manufacturing nation, headed by Hyundai Kia Automotive Group. South Korea is the world's largest shipbuilder, lead by several multinational corporations such as Hyundai Heavy Industries and Samsung Heavy Industries. Other important industries of South Korea include robotics and biotechnology, with the world's second Android EveR-1 and claim to have cloned the world's first dog, Snuppy. the three kingdoms of Korea. Archeological findings indicate that the Korean peninsula was occupied by humans as early in the Lower Paleolithic period. Korea began with the legendary founding of Gojoseon in 2333 BC by Dangun. Gojoseon expanded until it controlled much of the northern Korean peninsula and parts of Manchuria. After numerous wars with the Chinese Han Dynasty, Gojoseon disintegrated, leading to the Proto-Three Kingdoms of Korea period. In the early centuries of the Common Era, Buyeo, Okjeo, Dongye, and the Samhan confederacy occupied the peninsula and southern Manchuria. Of the various small states, Goguryeo, Baekje, and Silla grew to control the peninsula as rival kingdoms. The Buddhism and other influences from China had profound effects on Korea, which later passed on these, as well as their own advances, to Japan. The unification of the Three Kingdoms by Silla in 676 AC led to the North-South States period, in which the much of the Korean peninsula was controlled by Unified Silla, while Balhae succeeded northern parts of Goguryeo. In Unified Silla, poetry and art was encouraged, and Buddhist culture flowered. Relationships between Korea and China remained good during this time. Unified Silla weakened under internal strife, and surrendered to Goryeo in 935. 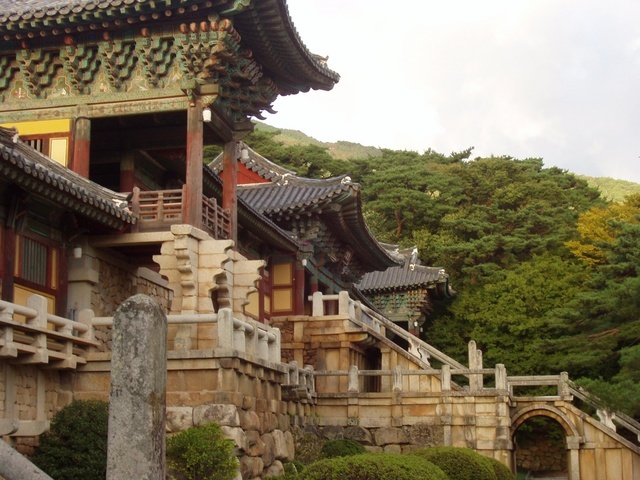 Balhae, Silla's neighbour to the north, was formed as a successor state to Goguryeo. During its height, Balhae controlled most of Manchuria and parts of Russia. It fell to the Khitan in 926 CE. After the North-South Period, successor states fought for control during the Later Three Kingdoms period. The peninsula was soon united by Wang Geon of Goryeo. Like Silla, Goryeo was a highly cultural state and it created the Jikji in 1377, using the world's oldest movable metal printing press. The Mongol invasions in the 13th century greatly weakened Goryeo. However, Goryeo continued to rule the Korean peninsula as a tributary ally to the Mongols. After the fall of the Mongolian Empire (by this time the Yuan Dynasty), Goryeo continued its rule. After severe political strife and continued invasions, Goryeo was soon replaced by the Jose on Dynasty in 1388 AC following a rebellion by General FYI Soggy. General FYI named his country Jose on (reference to Gojoseon) and moved the capital to Seoul. The first 200 years of the Joseon Dynasty were very peaceful and saw the creation of hangul by King Sejong the Great in the 14 century AC and the rise and influence of Confucianism. In the latter of the 16th century AC, Joseon was invaded by a newly unified Japan. During the Japanese invasions of Korea (1592-1598), centuries of peace had left the dynasty unprepared, and the lack of technology and poor leadership from the government and generals led to the destruction of much of the Korean peninsula. However, continued Korean dominance at sea led by Admiral Yi, the rise of local militias, and intervention of Ming China put Japan under great pressure, which soon retreated in 1598. Today, Admiral Yi is celebrated as one of Korea's foremost heroes and his turtle ships, used with great success against the Japanese, are considered the world's first ironclad warships, although lack of hard evidence of iron plating sparks much debate. During the last years of the Joseon Dynasty, Korea's isolationist policy earned it the name the "Hermit Kingdom," primarily for protection against Western imperialism. In 1910, Korea was annexed by Japan and despite widespread resistance, remained under occupation until the end of World War II in 1945. In the aftermath of World War II, Soviet Union and United States troops controlled the northern and southern halves of the country respectively. The two Cold War rivals established governments sympathetic to their own ideologies, leading to Korea's division into two political entities: North Korea and South Korea. Despite the initial plan of a unified Korea in the 1943 Cairo Declaration, escalating Cold War antagonism eventually led to the establishment of two separate governments: the communist North and the capitalist South. In the North, a former anti-Japanese guerilla and communist activist, Kim Il Sung and in the South, freshly shipped from America, Syngman Rhee were installed as presidents. On June 25, 1950, North Korea invaded the South leading to the Korean War. The Soviet boycott of the United Nations at the time, and therefore, no veto, allowed the UN to intervene when it became apparent that the superior communist forces would easily take over the entire country. The Soviet Union and China backed North Korea, with the participation of millions of Chinese troops. After huge advances on both sides, the war eventually reached a stalemate. 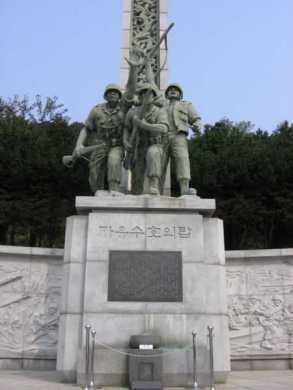 The 1953 armistice, never signed by South Korea, split the peninsula along the demilitarised zone near the original demarcation line. No peace treaty was ever signed and the two countries are still technically at war. In 1960, a student uprising led to the resignation of the autocratic and corrupt President Syngman Rhee. A period of profound civil unrest and general political instability followed, broken by General Park Chung-hee's military coup (the "5.16 coup d'etat") against the weak and ineffectual government the next year. Park took over as president until his assassination in 1979, overseeing rapid export-led economic growth as well as severe political repression. Park is heavily criticized as a ruthless military dictator, although the Korean economy developed significantly during his tenure. The years after Park's assassination were marked by, again, considerable political turmoil as the previously repressed opposition leaders all campaigned to run for president in the sudden political void. In 1980, there was a coup d'etat, by General Chun Doo-hwan against the transitional government of Choi Gyu Ha, the interim president and a former prime minister under Park. His seizure of power triggered nationwide protest demanding democracy, in particular the city of Gwangju, in South Cholla province where Chun sent in special forces to violently suppress the city, in what is now known as the Gwangju Massacre. Until 1987, he and his government held Korea under despotic rule when Park Jong Chul - a student attending Seoul National University - was tortured to death. The Catholic Priests' Association for Justice revealed that Park was tortured, igniting huge demonstrations around the country. The demonstrations snowballed when another student from Yonsei University, Lee Han Yeol, was killed by a police-fired tear gas bomb while he was demonstrating against the military government. The period of resistance is called the Resistance of June when all joined the national movement. Eventually, Chun's party, the Democratic Justice Party, and its leader, Roh Tae Woo announced the 6.29 Declaration, which included the direct election of the president. A view of Southern Seoul. In 1988, Seoul hosted the 1988 Summer Olympics, cause of national celebrations in contrast to great turmoil of the past. In 1996, South Korea became a member of the Organization for Economic Co-operation and Development and in 1997, suffered the Asian financial crisis but after swift recovery, the country was able to re-emerge and continue its growth towards a major economic power. 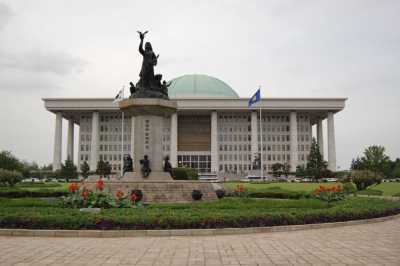 In June 2000, as part of South Korean president Kim Dae Jung's Sunshine Policy of engagement, a North-South summit took place in North Korea's capital Pyongyang. That year, Kim received the Nobel Peace Prize "for his work for democracy and human rights in South Korea and in East Asia in general, and for peace and reconciliation with North Korea in particular"
In 2004, South Korea joined the "trillion dollar club" of world economies. This page was retrieved and condensed from (http://en.wikipedia.org/wiki/South_Korea) see Wikipedia, the free encyclopedia, March 2008.